Mitsui Japanese Restaurant Taipei Review. Whenever I visit Taipei one of the restaurants I have to visit is Mitsui. I really love Japanese food, it’s beautiful and can be incredibly tasty, and Mitsui is one of the finest examples, if not the finest, in Taipei.Mitsui is also, by UK standards, incredible for value for money but there’s more on this below. Whenever I visit Taipei one of the restaurants I have to visit is Mitsui. I really love Japanese food, it’s beautiful and can be incredibly tasty, and Mitsui is one of the finest examples, if not the finest, in Taipei.Mitsui is also, by UK standards, incredible for value for money but there’s more on this below. Very smart and very modern. The service is impeccable. All of the staff are extremely knowledgeable and extremely attentive. They regularly top up your drinks and if you wait literally more than two or three minutes between dishes they apologise. If you also order a set menu the restaurant manager will personally take your order. 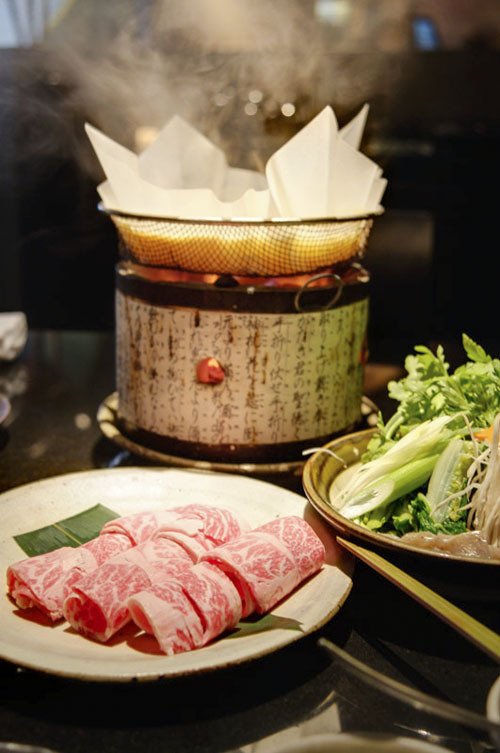 Kobe Beef Hot Pot (for information Kobe Beef is the Japanese beef that comes from Wagyu Cattle that are fed corn, massaged and given beer to drink). This might sound crazy but Kobe Beef is absolutely divine. How much? £50 each!!! In the UK this would have been £200-300 or more. Lobster Salad and the dressing was amazing! The second time around we ate differently. We ordered a set meal and three sushi platters. 2 sushi platters. This contained one piece of half cooked fish, roe sushi (roe is super tasty), salmon sushi and my favourite was the sea urchin sushi. Sea urchin looks and sounds disgusting but it’s absolutely divine. Another highlight was the squid sushi. Just two days before going to Mitsui we went to the food hall in the 101 building and had sushi there. The sushi is granted cheaper (cheaper than Yo Sushi and much better) but the squid sushi I had was a bit tough. The squid sushi in Mitsui just melted in your mouth. There were of course other kinds of sushi but naming these is fairly irrelevant. Deep Fried softshell crab. Chris is petrified of anything with more than 4 legs (strange I know!) but these small softshell crabs are delicious (Even he thinks so too! ). You eat absolutely everything and both the shell and the meat inside are some of the tastiest crab I’ve had. Endless supply of Chinese tea (I believe this was Oolong which I really enjoy). Total cost: About £30 each. Phenomenal! We originally planned to eat just sushi but after looking at the menu and based on past experience we had to order a set meal as well. Let’s also face it, we don’t go to Taipei very often. A note about pricing. The sushi alone would have been £40-50 in the UK but the quality of the sushi in Mitsui was on a whole different level. I will admit I have had better sushi in Japan itself but then you expect the best sushi to be in Japan. 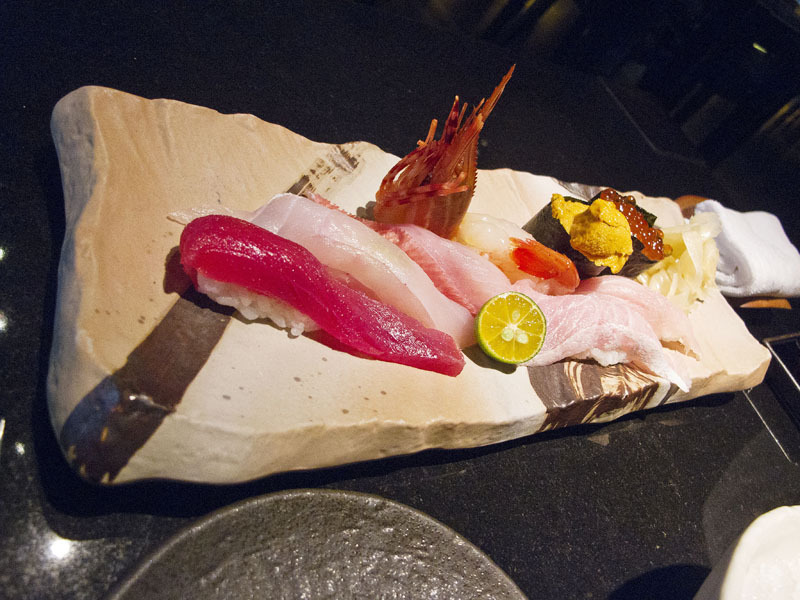 Each time we’ve been to Mitsui we’ve been utterly filled up and every dish was incredible. One thing I must point out was paying for the meal. If we eat in a regular night market or shop then we pay with cash but for a larger more expensive meal we always pay by card. Mitsui wouldn’t accept either mine or Chris’ credit cards as they hadn’t opened a line for international banking. I had to run down the street to a cash point, half scared that neither of us had any money in our accounts, then had to run back and pay. This wasn’t great. 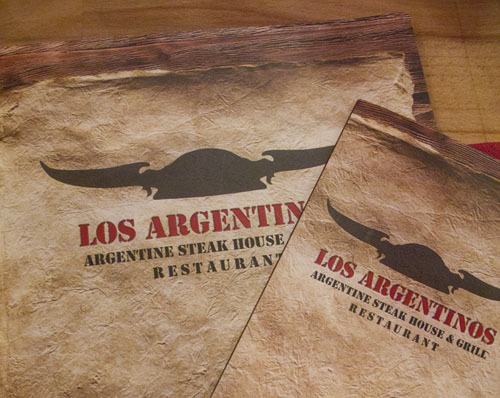 Last Sunday I went to an Argentinian steak house called “Los Argentinos” with Chris and our friends Michael and Anja. One of my colleagues has been talking about their Chimichurri sauce. When I heard about this sauce from my colleague I thought he was calling it “Jimmy Choori” and I joked with him about this restaurant selling designer shoes. A lot of people have said Argentine steaks are the best and as I’ve eaten American, Australian and Scottish steaks I was really curious to try this. I also did a little bit of research and read that Argentina is one of the top three exporters in the world for beef (the top three being Argentina, Brazil and Austrlalia). The interior of Los Argentinos is really simple. You can recognise this restaurant is a steakhouse from the gigantic cattle skin on the wall which you see immediately as you walk into the restaurant. I really can’t compare this restaurant to a steakhouse (if such a thing exists) in Argentina but I liked it. Every table has 1 or 2 pots of chimichurri sauce which you can just help yourself to. I ordered a no 52 Combinacio Ranchera and Chris ordered a 450g ribeye steak. Maybe Argentina has a different method of weighing steaks but we’re used to ordering steaks in ounces so when Chris asked the waitress to describe the size of the steak (if the largest steak was small he would have ordered something else) her response was less than friendly. 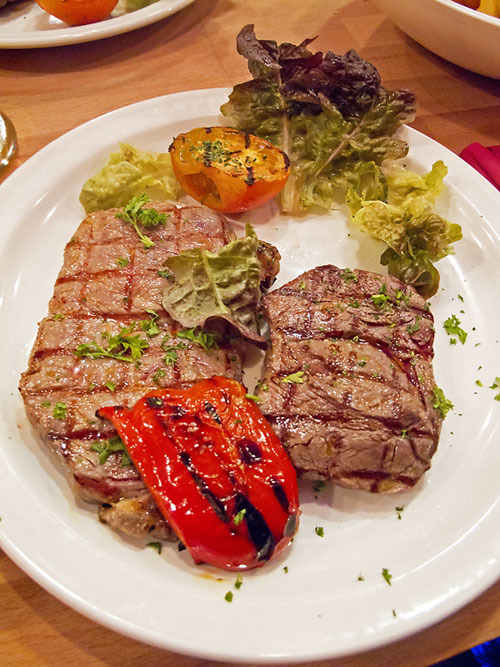 Some of the steak dishes come with fries and salad and you can choose between fries or baked potato. I had a lot of chimichurri sauce with my steak. All I can tell you is that this sauce is beautiful. I really really like it and I highly recommend you give it a go if you go to Los Argentinos. The steak itself was ok but with the chimichurri sauce it’s really superb! Service is ok but I do think the waitress can be a little more friendly. If you don’t know the answer to my question you could ask the chef in the kitchen or your manager, that’s certainly what we do in restaurants I’ve worked in. Our friends ordered ribs for their starters, which we sampled and were average. However Anja asked for her steak to be cooked really well done and after two attempts at cooking it, it still came back less than well cooked. I ordered my steak medium-rare and Chris ordered his rare. The selection of desserts was quite limited. Chris and I shared a pistachio and whipped cream ice cream, which was ok, but Anja ordered an apple pie which I really liked. It tasted like an American style apple pie rather than British style apple pie. I’ve always felt British apple pies are always quite thin, sour and have a rather sharp taste. The apple pie in Los Argentinos is really mellow, sweet but not sickly sweet and it’s warm!!! A slice of warm apple pie and some cold whipped cream is one of the best things ever, it almost makes my heart melt. In terms of what we spent, between the four of us we spent £103. This includes four steak/steak platters, ribs, two beers, one cider, one coke, a cappuccino, side order of onions, side order of fries, pistachio ice cream and a slice of apple pie. In conclusion, would we go back? Probably not. The waitress’ attitude, the undercooked steak and the overpriced menu would make us try other restaurants long before we come back here.